What better way to learn new ideas paving the way through the digital marketing industry, than with a community of like-minded marketers looking to strengthen their business. Conferences are a great opportunity to gather around some of the most innovative digital marketers from top companies and hear their business stories and marketing strategies. 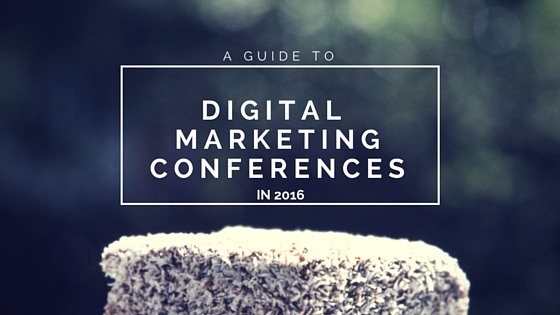 Here is a short list of digital marketing conferences you should attend in 2016. Digital Marketing Innovation Summit Connect with digital marketing gurus at the New York Conference March 10-11. The discussion will be led by executives presenting their innovative digital marketing strategies and will include panels, in-depth discussions, and networking opportunities. You are also able to watch these discussions on demand after the conference. LeadsCon LeadsCon Las Vegas 2016 brings leading business marketers and innovators under one roof, with three days of content-packed information for your marketing strategies. Starting March 15, the conference will discuss topics like content marketing, buyer & seller relationships and search engine optimization (SEO). The schedule also includes many opportunities to network, connect and exchange ideas with other digital marketers. Adobe Digital Marketing Summit Create amazing experiences for your customers at the Adobe Digital Marketing Summit in Las Vegas, March 20-24. Gain deep insight that includes over 150 hands-on labs and learn how Adobe solutions can help your company in all areas of digital marketing. Everyday at Summit you'll get the chance to meet your peers, network with companies, and make lasting connections. Social Media Marketing World Want to be a part of the largest social media marketing conference? Then consider attending Social Media Examiner's 'Social Media Marketing World' with 3,000 of your peers. The event takes place in San Diego, CA from April 17-19 and will include a array of 100+ expert led workshops and discussions. Hear from top brands, including Google, BMW, IBM and HP and connect with marketers at opening night party. The countless workshops, information sessions, and insight from top brand executives at conferences like these can really turn the marketing of your business around. Plan for 2017 now and I'll see you at the penny slots!